Actors Anushka Sharma and Varun Dhawan, who will soon star together in Sui Dhaaga, joined other celebrities in the 'PadMan Challenge'. 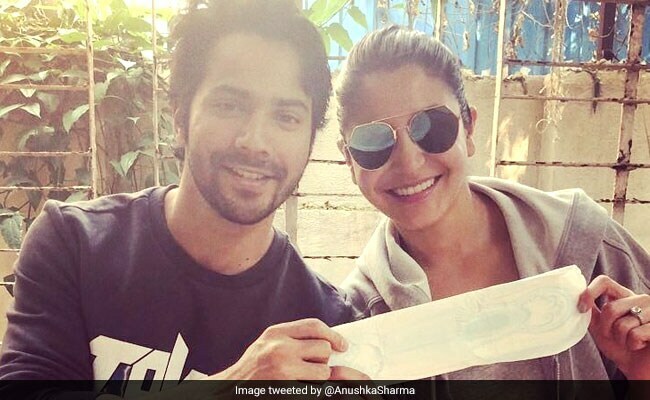 Anushka tweeted a photo with Varun, in which the duo can be seen holding a sanitary napkin. Anushka and Varun wished luck to PadMan stars Akshay Kumar, Sonam Kapoor and Radhika Apte and wrote: "Varun Dhawan and I just hanging out, holding a pad, no big deal, just another regular day." Varun and Anushka nominated Karan Johar, Katrina Kaif and Tiger Shroff for the 'PadMan Challenge'. The 'PadMan Challenge' has spread its web on social media. Celebs are tagging celebs to participate in the challenge, which requires them to post pictures of themselves holding a sanitary pad. "Padmaavat" star Deepika Padukone, Karisma Kapoor, Anil Kapoor, Madhuri Dixit, Aamir Khan and Alia Bhatt and many other celebs have shared their photos on social media. Here's what Anushka Sharma posted. The aim of 'PadMan Challenge' is to make menstruation a topic, as Twinkle Khanna said in her Oxford address to promote PadMan, which she produces. Akshay Kumar, who plays the lead role in PadMan, had tagged Alia Bhatt, Deepika Padukone and Virat Kohli, but so far, Virat hasn't completed the task. These are some other celebs posing with a sanitary napkin in the 'PadMan Challenge'. Thank you @murugaofficial for the #PadManChallenge ! Yes that's a Pad in my hand & I don't feel weird. It's natural, Period! The 'PadMan Challenge' was conceived by Arunachalam Murugunantham, the inventor of low-cost sanitary pad making machine. PadMan, based on a short story written by Twinkle Khanna, chronicles Mr Murugunantham's attempts to provide hygienic menstrual condition for the women of his family and ultimately to all the women with limited means. Meanwhile, Anushka Sharma and Varun Dhawan have started prepping for their film Sui Dhaaga. Recently, Anushka shared her picture on social media, in which she was seen embroidering a piece of fabric and she captioned it in Hindi as "Katran Se Buni Kahaani, Paiband Laga Ke Hai Sunani - Sui Dhaaga." Varun started prepping for the film last December and shared a picture of himself working on the sewing machine. Sui Dhaaga is based on the ideology of Make In India. Anushka Sharma married cricketer Virat Kohli in December in Italy. Her film Zero releases later this year and Pari is scheduled for a March release while Varun Dhawan will soon star in October. Akshay Kumar's PadMan will hit the screens on February 9.